Legend has it St Patrick came to Ireland in the fifth century to spread the word of Christ – and banish snakes from its shores. But as St Patrick's Day is celebrated today, it seems the patron saint's motives for leaving Roman Britain may have been less selfless than previously thought. Researchers claim that St Patrick actually fled to Ireland to avoid becoming a tax collector. Once there, however, it is claimed he took up an even more dubious occupation – as a slave trader. Patrick's father was a Decurion, a Roman official responsible for tax collection in Britain. But he used a bail-out clause in Roman law that allowed him to leave his post by joining the clergy on the condition the job was passed to his son. Dr Roy Flechner, an expert in ancient and medieval history from Cambridge University, claims that Patrick, alarmed at the prospect of taking on the unpopular job, decided to emigrate. As well as collecting tax (with any shortfall coming from the Decurion's own pocket), duties included road maintenance and the recruitment of soldiers. 'In the troubled era in which Patrick lived, which saw the demise and eventual collapse of Roman government in Britain in 410AD, discharging the obligations of a Decurion, especially tax-collecting, would not only have been difficult but also very risky,' said Dr Flechner, whose research is based on a new analysis of St Patrick's writings. Patrick was forced to find a way of retaining some of the family estate – in the shape of slaves – to pay for his new life in Ireland. Dr Flechner said Patrick may have become a slave trader because it was the only way he could transfer his wealth from England, as Ireland did not have a monetary economy at the time. Slaves were a highly valued commodity and Patrick's writings mention that his family owned several. Dr Flechner said: 'It may seem strange that a Christian cleric of Patrick's stature would own slaves, but in late antiquity and the early middle ages the church was a major slave owner. St Patrick's Day is celebrated the world over. 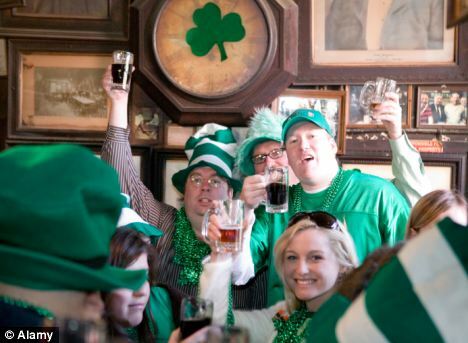 Here drinkers give a cheers at McSorley's pub in New York, in the U.S.
Dr Flechner claimed that the traditional legend of St Patrick's arrival in Ireland was invented by the man himself because that is how he wanted to be remembered. He also questioned the part of the legend that says before his arrival as a missionary St Patrick spent six years as a young slave in Ireland himself. 'The probability that Patrick managed to cross from his alleged place of captivity in western Ireland back to Britain undetected, at a time when transportation was extremely complicated, is highly unlikely,' he said.